West Pokot often hits the headlines for the wrong reasons; guns and cattle rustling leading the pack. But on Sunday 25th March, the story took a dramatic turn, for the better. Little known Kapenguria Heroes FC beat Gor Mahia Youth FC 3-0 on post-match penalties after a barren draw in regulation time to win the Chapa Dimba Na Safaricom National title in an exciting match played at the Bukhungu Stadium in Kakamega. For the win, the lads from West Pokot bagged a cool Sh1 million from Safaricom and a once in a lifetime opportunity to travel to London for a training and mentorship programme with Harambee Stars Captain Victor Wanyama. But just who are Kapenguria Heroes? The team was formed in 2009 with a mission to change the image of the Pokot community, says Ken Mnangat, a co-founder and Team Manager. “West Pokot has always been in the news for all the wrong reasons but mainly cattle rustling and banditry yet there are talented youth in the region,” says Ken. “A group of friends and I felt it was important to bring the youth from Pokot together through football and show the world that something positive can come out of this region as well. We combined all the small teams and formed a strong team – Kapenguria Heroes,” he adds. The team is nicknamed the Soccer Bandits after the general fame of the region. “We are not cattle rustlers or bandits; we want to change this negativity that surrounds the entire Pokot Community and also give hope to the youth through football,” says Ken. Ken also says that they chose the name Kapenguria Heroes to honour the Kapenguria Six – Bildad Kaggia, Kungu Karumba, Jomo Kenyatta, Fred Kubai, Paul Ngei and Ochieng Oneko who were arrested in 1952 and tried in Kapenguria during the fight for independence. The team was registered in the County League and rose up the ranks to the Division Two League. In 2011, they took a bold step and registered in the Domestic Cup, then known as Football Kenya Limited (FKL) Cup. They were however knocked out by Gor Mahia in the Round of 32, following a 2-6 loss at the City Stadium. Ken says this was a learning curve for the team and they picked their lessons and moved on. Seven years on and Kapenguria have now beaten Gor Mahia Youth to lift the prestigious Chapa Dimba Na Safaricom title. Ken says this is sweet revenge for them. “For our U20 to beat Gor Mahia Youth at this level it means our hard work and dedication has paid off and we are really happy. It has been years of sweat and as a team we are really glad that we have achieved our main objective of unearthing talent from Pokot.” Ken says. The team manager is quick to add that their success at the Chapa Dimba Na Safaricom Tournament has been a culmination of good planning and dreaming big. Kapenguria Heroes’ success has also brought success to individual players with some of them getting scouted and signed by Kenyan Premier League clubs. Their top striker David Majak, who scored 15 goals in the entire tournament, is already signed on a long term contract at Kakamega Homeboyz as well as the team captain Fredrick Krop. The trio of goalkeeper Brian Lumumba, Emmanuel Krop and Brian Kakupo have also joined the youth side of Zoo Kericho FC. Kapenguria Heroes player David Majak poses with his Golden Boot trophy. He scored a total of 15 goals in the entire tournament. 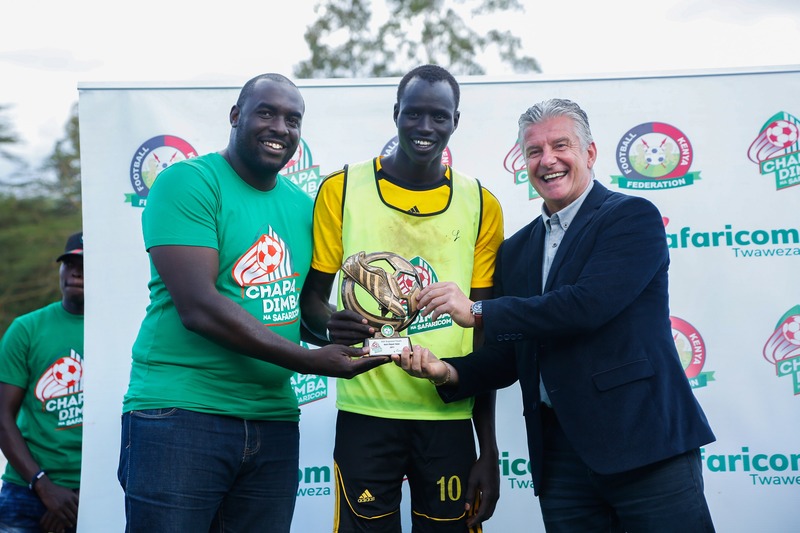 Majak, who was named the Player of the Tournament, bagging Sh50,000 in the process, adding to the Sh30,000 he won as the top scorer during the Rift Valley Region finals, is happy to have helped the team win but personally, is really looking forward to meeting Tottenham Hotspur striker Harry Kane in London, whom he says is his role model. “I really like Tottenham Hotspur and the main reason I worked really hard in this tournament was to win the ultimate ticket to travel to London to watch Tottenham face Manchester City at Wembley. I hope to use the opportunity to meet my role model Harry Kane whom I really admire. This is a dream come true for the entire team” he said. The success hasn’t come without its fair share of challenges though as Team Manager Francis Mnangat opens up. Having won Sh1 million, they now hope to nurture more talent at the grassroots level. “We were promoted to the Division Two League but only played for a season and withdrew. We have been focusing on tournaments since its really tough financially to sustain a team in the league. The West Pokot County Government has been supportive during the Chapa Dimba Tournament and my hope is that they will continue supporting sports,” he says. “The Sh1 million we won is a huge boost as it will now help us to continue nurturing talent. We will rejoin the league and also pay school fees for some of the needy students in the team, and they are quite several. Our plan is to hopefully have a sustainable income generating project in the near future,” he says. The Soccer Bandits are surely changing the face of West Pokot, one game at a time.